Chasing the Rainbow for a Good Cause! Our goal for this year’s holiday campaign is $15,000. Help light the way for people with dementia and give a gift this holiday season. Donate by December 31 and your gift will double thanks to a $15,000 matching donation from Neil Carlson, Sean Lawton and Elden Wittmier. Our matching donors were inspired by Kerri Pleskach’s story, and we hope it will inspire you as well. Click here to view Kerri’s story on Facebook. Click here to view Kerri’s story on YouTube. THANK YOU to all those who have given to the holiday campaign so far! 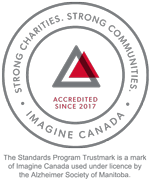 There’s a lot going on in the Alzheimer Society’s Minds in Motion program. People with dementia, along with a family member or friend, participate in physical activity, mind-stimulating activities and socialization opportunities. Some participant pairs can’t get enough of the program, so many stay involved by signing up for one eight-week session after another throughout fall, winter and spring. While the program offers a number of positive outcomes for participants ̶ sharpened cognitive functioning and improved flexibility, to name just two ̶ an unexpected benefit for family caregivers attending the program is apparent: they get the chance to meet and visit with others who are in a similar life situation. Sheila Kemplay and Nancy MacDonald are two such participants. They have attended Minds in Motion sessions at the same location for over two years with their husbands, who have dementia. Both women say that they and their husbands get a lot out of the formal part of the program, but they’ve also found in each other someone to talk to during unscheduled moments. When she’s talking to Nancy, however, Sheila doesn’t have to think twice about what she’s going to say or whether or not to use a certain word. She just says it! Nancy’s situation is similar to Sheila’s. While husband Donald likes to try to participate in conversations, he is not as verbal as he used to be. So, Nancy enjoys the socialization she gets with Sheila and some of the other participants. 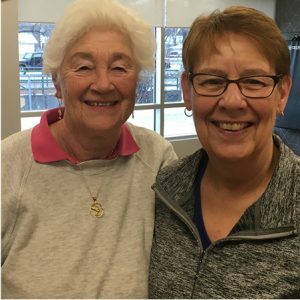 Both Nancy and Sheila plan to sign up again for the winter Minds in Motion program at the YMCA-YWCA of Winnipeg’s South Branch. While there, they and their husbands will get some exercise, both cognitive and physical. Perhaps they’ll keep the beat on a few percussion instruments during a music session. They’ll gather with the group between activities to enjoy coffee and snacks. And last but not least, they’ll enjoy the extra benefit of Minds in Motion: sharing with each other through friendly conversation. Click here to register for at a Minds in Motion location near you! Two sisters and their two young neighbours in southern Manitoba used a rainbow of colour to help increase awareness about dementia while raising money for the Alzheimer Society. Tessa Elias, 13, and sister Alia, 14, along with neighbours Sam Bergen, 13, and his sister Maria, 10, live near Winkler. 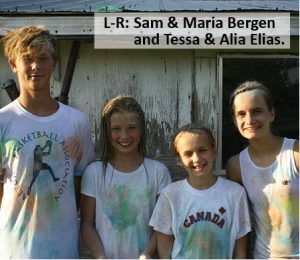 The foursome organized “Chase the Rainbow,” a 30-minute run during which participants were pelted with homemade coloured powder. The powder stuck to their T-shirts, making for a brilliant display of purple, pink, blue, green, red and yellow. Selecting the Society as the charity of choice for this August 15th grassroots event was not a random decision for the sisters. Quite the contrary. Tessa and Alia fondly recall their neighbour, Bill Enns, who passed away last March. They called him “Papa” and visited him regularly, even though he had dementia. Eventually, Papa’s dementia became noticeable and he’d forget the girls’ names. They were saddened by this, and felt bad when he moved away to live in a personal care home. They continued to hear about Papa through his wife, Betty, who stayed living in their home for a time. When Betty heard about the girls’ efforts, she was thrilled. She told them that, if Papa were here today, he would give them a big hug. Tessa and Alia happily accepted a hug from Betty on Papa’s behalf. Talk to any pet owner and you’re likely to hear stories about how “Spot” enjoys getting his tummy rubbed or how “Tabby” likes to cuddle up on a lap and purr. The unconditional acceptance provided by an animal friend can bring joy and companionship to its owner. 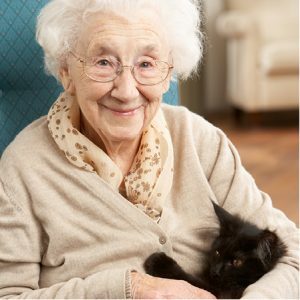 Anecdotal descriptions such as these are backed by studies assessing the impact of animals on the health of older adults. For example, through a PubMed review, researchers from the University of Miami looked at previously completed studies that investigated the impact of various pets – and not just the furry kind. Pets included dogs, cats, birds, fish and even stuffed and robotic animals. Although the studies showed many benefits, they also highlighted a few drawbacks, such as: the cost of owning a pet; the complexity and time commitment needed to care for a pet; potential injury to self and others; and extreme grief and anxiety over the loss of a pet. As each person’s experience is unique, careful planning is important when deciding to bring an animal into someone’s life. What are the positives for that person? Do they outweigh the potential drawbacks? Whatever the decision, there is little doubt that animals are accepting and nonjudgmental, and interactions with them can be a positive experience. The holiday season is coming! It’s a time full of activities, such as shopping, cleaning, preparing for visitors and going to special holiday festivities. While we all look forward to spending quality time with family and friends, the busyness can be overwhelming for many – and even more so for those who are caring for a person with dementia. Here are tips that can help you keep the holiday season pleasant and enjoyable. 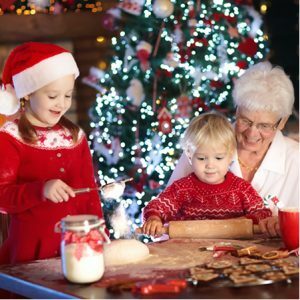 Involve the person with dementia in holiday preparations within their capabilities. The festivities may trigger some excitement and reminiscence of past holiday memories. Keep the decorating simple and only bring out a few decorations that have special meaning. Avoid twinkling or flashing lights as these can cause disorientation and other responses. Simplify traditions and maintain only the most important ones. For example, have a special dinner, but make it a potluck rather than doing all the food preparation yourself. Try to avoid large groups, strange places or making significant changes to routine. These may cause confusion or frustration for the person with dementia. Cut your ‘to do’ list so you have more time and energy to be with the person with dementia and your family and friends. Trust your instincts if you are feeling overwhelmed and tired. Change your plans to ensure that you get your rest. Accept help when it is offered. This can be a wonderful way for family members and friends to spend time with the person with dementia. Take care of yourself so you can take care of the person with dementia. Remember: you are doing a great job and you mean a lot to the person with dementia. Don’t Miss Gala 2019 – A Night in Croatia!